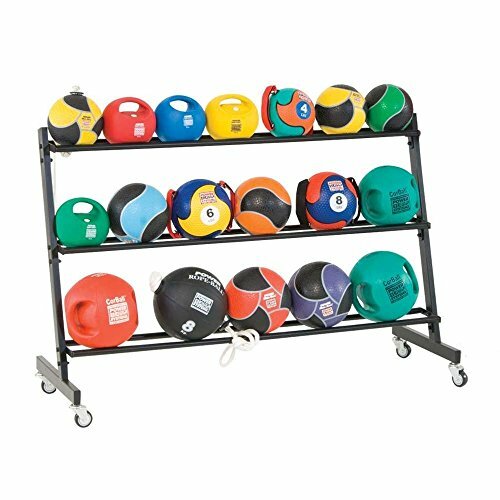 Store a variety of medicine ball sizes with our 3-Tier Med Ball Rack. The trays can increase in width from top to bottom, allowing for many different sized balls. Holds up to 21 balls with 8 inch diameter or 15 balls with 11 to 12 inch diameter. Locking casters for easy transport. Fits through most doorways. Assembly is required. Balls sold separately. Ships in two boxes. Steel. Gray. 58 x 20.5 x 38 inches (L x W x H) . Since 1986, Power Systems' passion for fitness has been fueled by our customers. Power Systems is committed to ensuring people have the tools to lead active lives with professional-grade products, cutting-edge educational materials, and elite customer service. "Power Your Potential" is the philosophy that guides everything Power Systems stands for.